I got the idea for this recipe here. I was sadly disappointed when I found out this was used with an ingredient similar to Nutella, but not quite the same, so of course I had to try it out with the real stuff! Hope you enjoy it as much as I did! Combine all ingredients in a small saucepan. 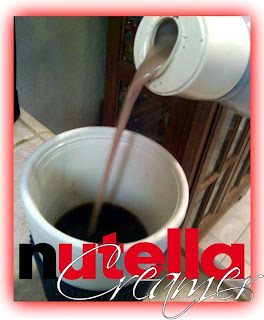 Heat over medium-low heat, stirring constantly, until the chocolate has become fully incorporated with the milk. Store in container & refrigerate. "Christopher, if you don't pick up your toys I'm going to ...'insert horrible consequence here'..."
I care more about their toys than my kids do. Seriously, it's true. I bet if you really dig deep & think about it, it might be true for you too. I've really been trying to get mine & my family's priorities straight from everything to finances, the home & even the time we spend. That's when it occurred to me. 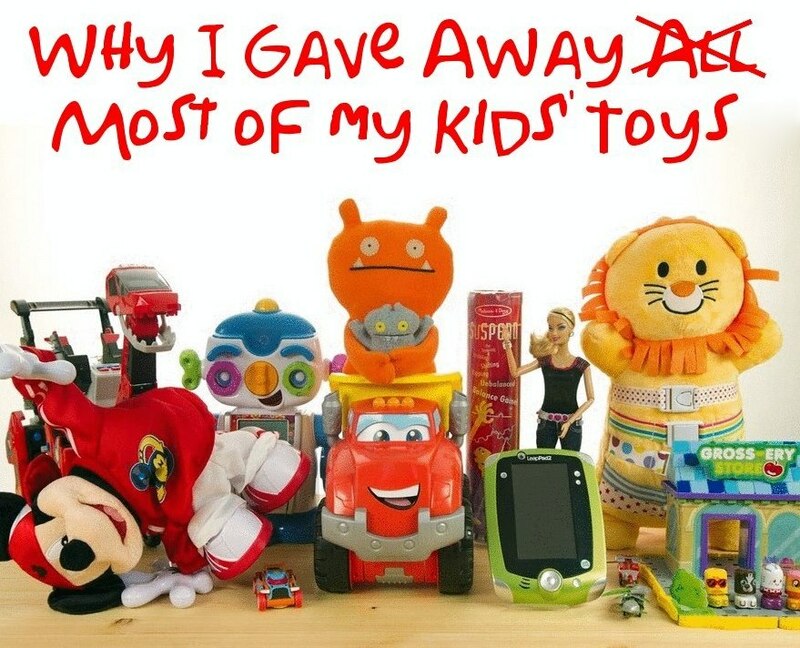 We are spending way too much time & energy on toys & not enough on things that really matter. Pieces of plastic & wood. Things that are just that...things. What we have doesn't really matter, however, where we choose to spend our time does. I couldn't shake the feeling that I really wanted my kids to thoroughly know this. Not to mention my kids are infamous for what I like to call the 'Dump & Run' which consists of them dumping out a bucket, or sometimes even an entire toy box full of toys & running off to go do something else giggling along the way. So thinking about the above bible verse I decided that toys were no longer going to be the center of our household, our time, or our efforts. We got rid of EVERYTHING except for a set of blocks, a car track, their play kitchen & about 5 other small toys. This was a major breakthrough for us considering to start with, there were three fully packed toy boxes, over 20 stuffed animals, small random toys, & puzzle pieces galore. And you want to hear the craziest part? They were happy about it, mommy on the other hand struggled a bit. I just kept thinking "I paid 20 bucks for that!" or "Well, we haven't even had this one for very long." But you know what? I would rather spend time teaching them to give to others than thinking of ways to get them to consistently clean them up. I want them to know we don't need "things" to have fun, or to spend time on. We can instead spend time on each other, & use our imigainations (which are why we kept the few toys we did) to play. Plus there are no more clean up frustrations which means we can spend more time on the books we kept, or the games we like to play, or learning about God together. & how blessed are we that we have enough "stuff" to give to others? Our cup is overflowing & we didn't even realize it. They understood the lesson though. They gave with joy & greafulness. No tears or screaming, quite the contrary from what we're used to at clean up time. Thank God for my childrens' giving heart. Despite my long hiatus, I am coming back with a vengeance. I am more than excited to bring you new content, tutorials & advice. Soon you will see more sections pop up, on dating your hubby, free printables, budget saviness, & SO MUCH MORE! No more hiding, it's time to do it big. We got a makeover, & the time is coming for growth! Easy peasy & super worth it. I've used all sorts of dry shampoos & I loved the concept, but didn't love the price. So I found this wonderful recipe here. For those of us with thin oily hair, we need showers more often than most. I was having to shower everyday...not that I needed it, but my hair certainly did. With two little boys all over the place, showering everyday is not always realistic, & I'm not big on ponytails so this is the way to go for me. I LOVE this stuff. I guess that sounds kind of scary, but for me it's wonderful! I saw some people had concerns with it turning your hair a different color but I've been using this consistently (every other day) for 3+ months now & have never had any problems with it. 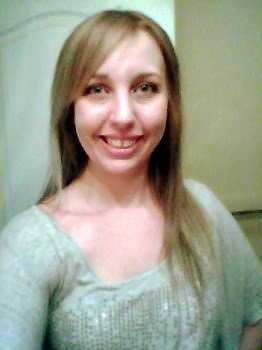 My hair is brownish & dyed & I've also used it with blonde hair both of which I didn't have any problems. I only spray it on my roots & I don't get crazy with the amount I use. I lift my roots with a brush or my fingers, spray it in, & let it dry before I brush it through the rest of my hair. It gives me volume which is nice too. I would be really interested to see how it works on other hair types, so leave me feedback if you try out this recipe! Okay so it's been a while. To make it up to you guys, I decided to post a pretty good one (or at least I'd like to think so). I'm not sure if you guys have ever heard of the Accountable Kids program, but I thought it was an absolutely amazing idea after I researched it. In short terms, your kids have certain chores each day that they earn "tickets" for in which they then cash in for things like TV time, or special activities or things of the like. If you want more detailed information I suggest you check out the link, you may have to watch their video a few times to get all of it because it's pretty complex. Anyway, it inspired me to make my own version of it. 1. Because I could dumb it down a bit & 2. Because I don't like spending money. It took a bit of time, but it was SO worth it! My 3 year old absolutely loves this program, & honestly I do too. Here's what ours looks like. Now our system is a little bit different & a little more simple. Here's a breakdown. The above is Christopher's daily chart. The green squares are things he's expected to do on a daily basis, the yellow squares are his WEEKLY rewards, & the red squares are things that aren't acceptable in our home. 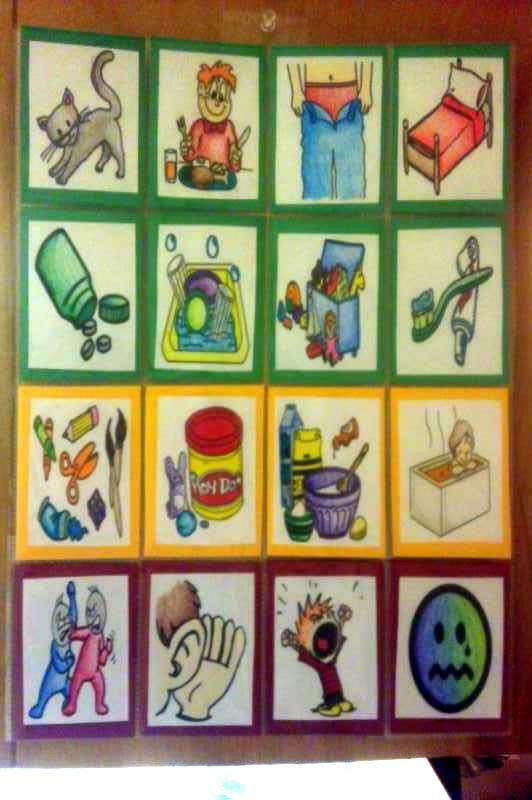 The great thing about our version of the system is that chores, rewards, & unacceptable behavior are all readily displayed for the child to see. Also the cards are easy to replace at any time if you want to change the chores, rewards, or bad behaviors. The other component our system has are "bucks" rather than "tickets" that we use to reward good behavior immediately. On the left are what are bucks look like, & the right are the replaceable cards for the chart. Now the bucks are pretty simple. Christopher gets a buck every time he does his chores (the green squares) or displays really good behavior like, listening well, sharing, helping with extra chores etc. Every time he shows behavior we don't like (the red squares) we take a buck away from him. Bucks are used for small things like 30 minutes of TV, listening to his music on the way to school, an extra story at bedtime, & things of that nature. He can save up bucks, or spend them as soon as he gets them, it's up to him. This is great because it shows him that things like TV, & other extras are privileges NOT something we owe him. He needs to be good in order to get good things in return. We've been on the system for over a week now & saw IMMEDIATE results the first day we used it. Now the last part works with the rest of the system & is simple as well. Each day that we had a good day (determined by how many bucks he earned) we put a pretty stone into his jar before bedtime. If we didn't have a good day, he simply doesn't earn a stone that day. Now these aren't like bucks because they cannot be spent right away, or by his choosing. Once he has earned 5 stones in his jar, they can be spent on a bigger reward (anything pictured in the yellow squares). We chose things like going to the park or the Children's museum, going out for ice cream, or staying the night at grandma's. This is great because it teaches him longer term goals too. Not everything has instant gratification, & sometimes we really have to work for the things we want. Our system did take a lot of time to make, but was pretty easy. All of our supplies we already had on hand, or were able to purchase at the dollar store. The chart is made out of baseball card sleeves. I just cut them & taped them together in the back until it was the size I needed it. The cards are just printed pictures I found (& colored) from online since we only had black ink. I just taped them to green, yellow, & red cardstock paper & cut everything to fit the card sleeves. The bucks are made from foam rectangles I picked up at the dollar store & cut into thirds. Each one has a foam sticker that I placed in the middle of each buck & it made PLENTY. You can use any old jar & stones (or marbles, or beans, or whatever you have around) for the long term reward. Let me know if you have any questions in the comments below, or on our Facebook page! 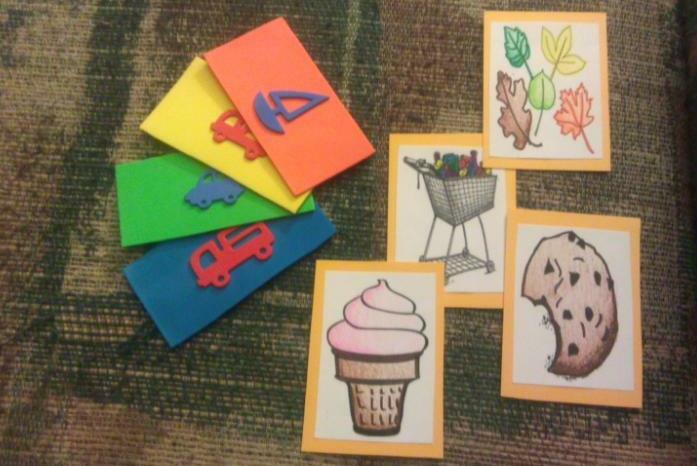 Here are the printables for the pictures I used in my chart. Keep in mind these are specific for my family & you may need to get creative & add some of your own as well. Color them with your kids, or feel free to leave them as is. P.S. coloring is way more fun! Good luck! I have a confession to make...I hardly ever polish my wood surfaces...especially in the bathrooms or kitchen where the wood dries out easily. It just happens to be one of those things I don't notice until it's too late. My eyes don't see it until it's crusted in little boy fingerprints, cooking spills & completely dried out. I think this is a condition somewhat related to selective hearing, but I can't really be too sure. Either way here's my cheap & easy solution! Oh & please don't judge me for my before pictures, or even if you do, please don't tell anyone I know. Maybe they haven't noticed yet? That's it! Mix it all in a bottle & just shake it before you spray it each time because the oil & water separate! Okay okay, I'm a procrastinator. Christmas is over, the presents have all been unwrapped & Santa went home, but this is still a really cute recipe considering it's still winter & New Years Eve is on it's way so I thought I would post it anyway. 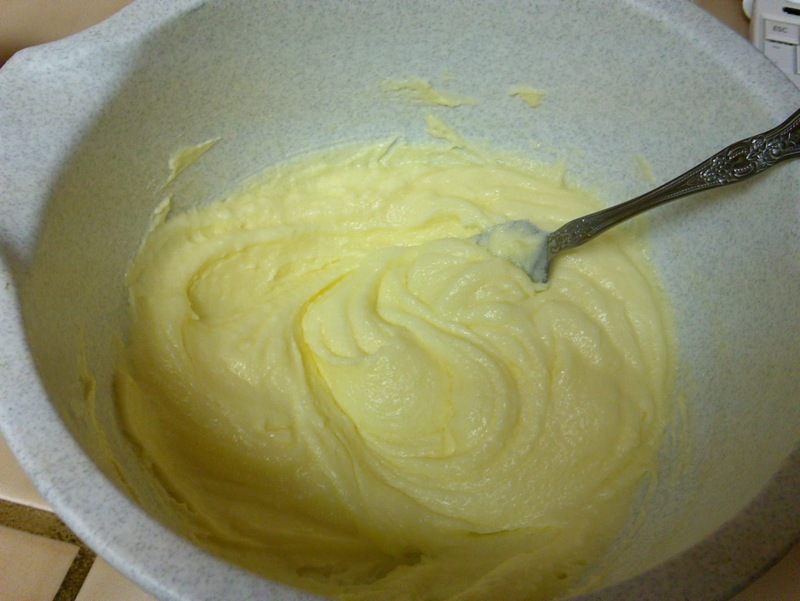 Step 1: Cream the margarine and add the sugar gradually. Beat until light and fluffy. Step 2: Add eggs one at time, mixing well after each addition. Step 3: Mix in all other ingredients & chill dough overnight in the fridge (4 hours at least). 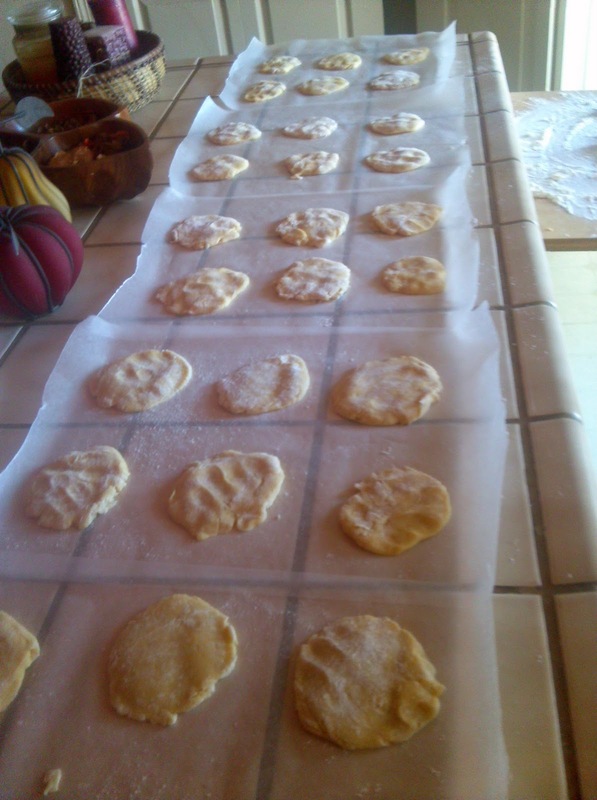 Step 4: After dough has been chilled, pat cookies into a circle-ish shape. They don't need to be pretty, the icing will "melt" better if there are lumpy areas. Bake at 375 F for 6-8 minutes or until they're golden brown. I wish I had pictures but I was so focused on getting the recipe right that I didn't take any. Plus I had to tweak the recipe a lot in order for it to work for me which I reflected my above. You may have to change yours to a consistency you feel comfortable with. Mine was too thick at first so I added more vanilla & more egg whites to give it that liquidy feel. If yours is too thin, add some more powdered sugar. 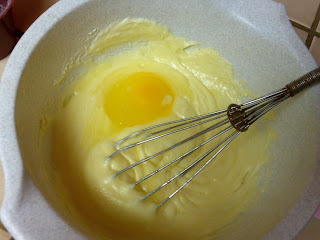 Step 1: In large bowl, combine the egg whites and vanilla and beat until frothy. 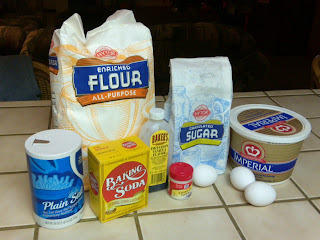 Step 2: Add the confectioners sugar gradually and mix on low speed until sugar is incorporated and mixture is shiny. NOTE: You may want to do this part by hand because mine got so thick my hand mixer started to give in. 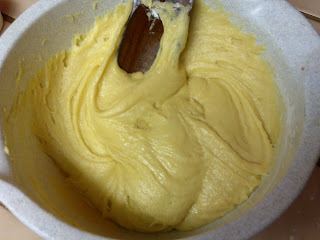 Step 3: Turn speed up to high and beat until mixture forms stiff, glossy peaks. (For those of you who don't know...hey I didn't...peaks mean that when you dip a spoon in & pull it out, there is a little peak that sticks up after the spoon has been removed). This should take approximately 5 to 7 minutes. Add food coloring, if desired. This part is easy peasy. Just put some shortening on a plate, put a bunch of marshmallows on it & pop it in the microwave. DON'T LET THEM GET HUGE. It's tempting but seriously don't, they will turn into rocks. Just wait for them to inflate a bit & then pull them out. Make sure you have shortening on your fingers so they don't stick to you. Have fun! I know we did! This is where I got the idea from! I am a mommy to Christopher & Joshua, & a wife to my husband Ryan. We put God at the center & everything else falls into place. We're pretty busy around here, but we like to keep it simple. If you are looking for recipes, kids activities, or even DIY solutions then you are in the right spot. Enjoy!